NEW FROMTHE HORZE FALL 2016 COLLECTION!! These technical breeches with their unique swirled color-block are a sporty and stylish choice. The Kiana breeches have a swirled color-block pattern that creates a stylish look. The stretchable fabric and elastic leg bottoms add comfort. These medium/low-waisted breeches in subtle elegant colors are a sophisticated and practical addition to your wardrobe. The Horze Crescendo logo on the rear and front badge add a finishing detail. Vertically stretchable Alos leather fullseat. Special cut on the knee area to avoid rubbing on the full seat seam. Side seam moved to the front to create a slimmer silhouette. Special silicone printing on the seat allows for a good grip in the saddle. Technical description: Eros fabric, 93% polyamide, 7% spandex, woven. Washing instructions: Machine wash warm at 40°C/105°F. Wash inside out with similar colors. Do not use fabric softener. 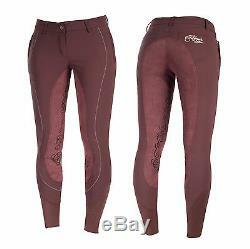 The item "Horze Crescendo Kiana Women's full seat breeches Burgundy" is in sale since Wednesday, August 9, 2017. This item is in the category "Sporting Goods\Outdoor Sports\Equestrian\Clothing & Accessories\Other Rider Clothing".